Conor McGregor and his hotheaded posse were banned in Brooklyn and — as UFC would hope — presumably not lurking in the bowls of Barclays Center looking for a brawl. After one of the UFC's most chaotic weeks — with McGregor led from a police station in handcuffs and charged with throwing a hand cart at a bus — the promotion got down Saturday night to what it does best: Put on a show. But a card nonetheless, with chairs and guard rails firmly planted on the floor. 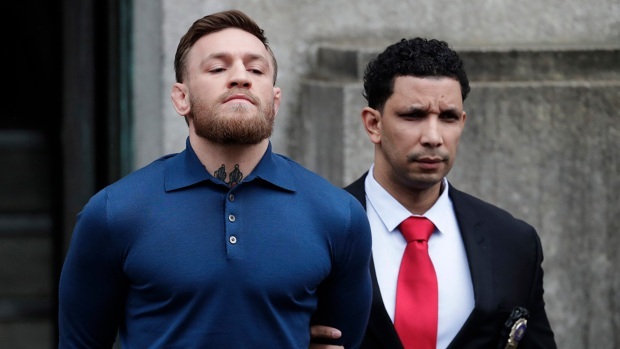 Mixed martial arts fighter Conor McGregor is led away from a Brooklyn, New York, police precinct to face a judge Friday morning. McGregor was arrested after he was caught on camera going on a backstage rampage at a UFC press conference. McGregor's boorish behavior got him tossed in jail, facing felony charges in a New York courtroom and, on a less serious note, led to UFC scrapping three fights on the UFC 223 card. McGregor was arraigned Friday on charges of felony criminal mischief charges and misdemeanor assault, menacing and reckless endangerment charges. He was released on $50,000 bond. UFC has not disciplined McGregor though everyone involved in instigating the press conference day fight on Thursday was not allowed at the arena. Flyweight Ray Borg was on the bus attacked by McGregor and was forced off the card because he suffered multiple cornea abrasions when he struck by broken glass. "Hey what do you know food was taken off my families plate for something out of my control," he tweeted . Mixed martial arts fighter Conor McGregor was charged with with three counts of assault and one count of criminal mischief after causing mayhem at a UFC media event. The original main event was tossed into disarray when scheduled lightweight challenger Tony Ferguson suffered a freak knee injury on a promotional stop and had to withdraw. Featherweight champion Max Holloway stepped up on six days' notice to fight Khabib Nurmagomedov in the main event for the lightweight belt, but was deemed by the New York State Athletic Commission medically unfit to compete in his failed bid to hit the 155-pound mark. Al Iaquinta, winner of five straight fights, was tabbed to fight Nurmagomedov in a title bout stuck with an asterisk. Nurmagomedov would become the 155-pound champ because McGregor — in a move unrelated to the melee — was stripped of the belt. McGregor hasn't fought for UFC in 18 months. Iaquinta weighed in 0.2 pounds over the 155-pound limit and would not win the title with a win. That was until UFC President Dana White clouded up the bout a bit when he said Iaquinta would become the "recognized" champ with a victory. Otherwise, UFC hummed along into its Brooklyn return. Rose Namajunas was scheduled to defend her 115-pound strawweight title against Joanna Jedrzejczyk in the co-main event. UFC poked fun at the lightweight situation on its Instagram caption on a photo of the arena just before the card started, "They're all in bubble-wrap and ready to go!" Because the mayhem rearranged the card — Holloway vs. Nurmagomedov T-shirts were still on sale for $40 at Barclays — UFC offered full refunds. There was no immediate word from UFC on how many fans took the company up on the offer.